Anthony Joshua is the betting favourite to win inside the ring when faces Joseph Parker in Cardiff on Saturday 31st March 2018. Anyway, Coral is offering a tasty price boost! 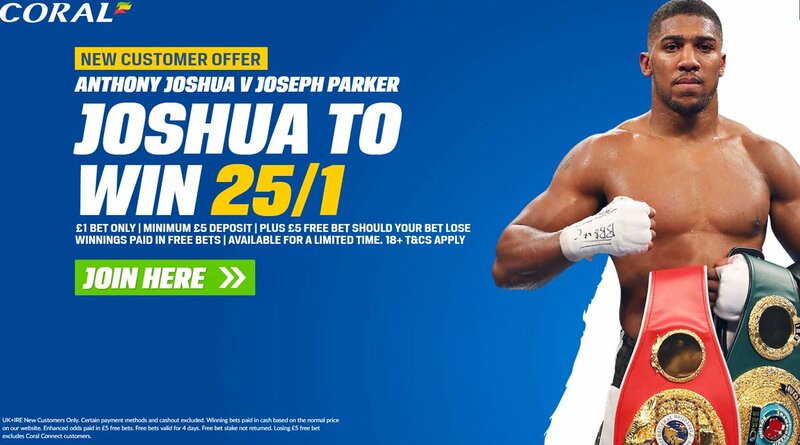 Find below how to get 25/1 Joshua to beat Parker, plus £5 in free bets if he doesn't! Joshua vs Parker is a fight everyone wants to see and every punter wants to bet on it! The Watford native and home fighter the strong 2/5 favourite but we have partnered up with Coral Sportsbook to offer you and enhanced 25/1 on Anthony Joshua to win the bout! 25/1 Anthony Joshua to win! 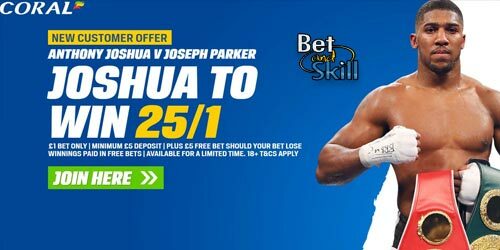 Coral offer 25/1 Anthony Joshua to beat Joseph Parker + £5 free bet! Register a new account with Coral before the start of the fight and get a hugely boosted 25/1 Anthony Joshua to win vs Joseph Parker on Saturday 31st March 2018 - You will not find a higher price on the Joshua vs Parker bout! Should you win, your enhanced winnings will be paid as free bets. Should you lose, Coral will give you a £5 free bet as a consolation prize! Are you lloking for more boosted offers? Take a look at our Enhanced Bets page! AJ has recorded 20 knockout victories from his 20 fights so far, including that one against the legendary Wladimir Klitschko. He possesses the physical edge with a two-inch height advantage over Joseph Parker and a vast six inches extra in reach. Parker has beaten Hughie Fury by split decision on his last fight. Fury wasn't previously able to get past Carlos Takam inside the distance while Anthony Joshua defeated Takam by TKO in the 10th round at this venue back in October despite being hampered by an early clash of heads. Joseph Parker is still unbeaten but his chin is yet to be tested at the truly elite level. Anthony Joshua is backable at 1/7 with the main online bookmakers, 25/1 by taking this offer! Coral are offering all new customers a massive 25/1 Anthony Joshua to win vs Joseph Parker, get your price boost in less than two minutes! Normal winnings will be paid as cash based on odds you get at Coral. If Anthony Joshua loses, you will receive a £5 free bet. Deposits made with Neteller, Paysafe and Skrill (Moneybookers) do not count towards this promotion. "Get 25/1 Anthony Joshua to beat Joseph Parker at Coral + £5 free bet"